Annapolis takes on a particular beauty when viewed from the waters of the Bay. Here are a few of the sights to see! Many people recognize the city of Annapolis as one of the most beautiful cities on the East Coast. However, if you’ve only seen the city on land, you’re missing out on half of its beauty! 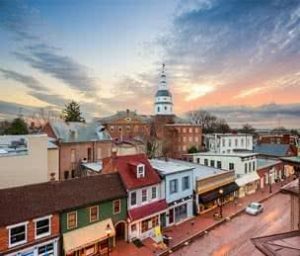 Annapolis is known as the sailing capital of America and locals would argue that its best side is only visible from the waters of the Chesapeake Bay. When you charter the schooner Liberté for a tour of Annapolis, you’ll discover a fresh perspective of the city and see many of the most beautiful sights it has to offer. Here are just a few of the sights you can see from a Liberté charter in Annapolis. Founded in 1845 and situated on a tract of land reclaimed from the Severn River next to the Chesapeake Bay, the Naval Academy is one of the most recognizable symbols of Annapolis and features a gorgeous campus. The definitive highlight has to be the domed chapel which takes on a particular beauty when viewed Bayside on the Liberté. While most would struggle to describe the Bay Bridge as “beautiful”, it is certainly one of the most well-known features of Annapolis as the crossing of choice for millions heading down to the shore every summer weekend. The sheer scale of this massive bridge is hard to appreciate in a car – but view it from the water and you’ll discover a new appreciation for the engineering and construction work that went into this project! This lighthouse is the most recognized lighthouse in Maryland and is currently the last unaltered screwpile cottage-type lighthouse still standing on its original foundation in the Bay. It was constructed in 1875 and added to the National Register of Historic Places in 1975. It continues to be an active aid to navigation on the waters of the Bay and is maintained by the Coast Guard and the city of Annapolis. You can even tour the lighthouse during the summer months! Regardless of when you book your charter on the Liberté, however, you can discover the quaint beauty of this Maryland landmark for yourself. Although we have only listed a few of the wonderful things to see aboard the Liberté, we offer many custom cruise options to meet your group’s agenda. Contact us today! Discover Annapolis On The Water with the Liberté! The Liberté provides private charters in Cape Cod and Annapolis as well as public sailings in Cape Cod. Celebrating aboard the magnificent Liberte is a great way to create cherished memories that are sure to last a lifetime. If you want to charter the Liberté for your next corporate event or wedding reception, contact the Liberté today! Call us today and we will be sure to respond within 24 hours. Be sure to also check us out on Facebook, Google +, and Twitter. This entry was posted on Friday, April 6th, 2018 at 10:33 am. Both comments and pings are currently closed.